Coaching on the Poulenc Sonata with Dr. McClellan. Photo by John Coppa. 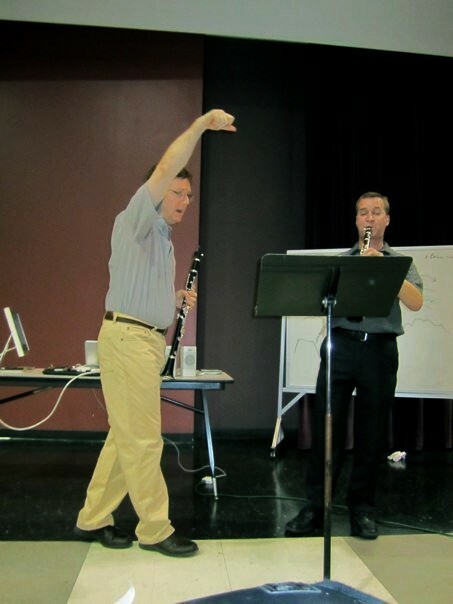 I’m back from the Clarinet Academy of the South, a weeklong series of masterclasses by Robert DiLutis and D. Ray McClellan. The “Academy,” in its inaugural year, was held at the lovely campus of my recent alma mater, the University of Georgia. Dr. McClellan is the clarinet professor at UGA, and a former member of the President’s Own Marine Band. Mr. DiLutis is the clarinet professor at Lousiana State University, and formerly of the Rochester Philharmonic and the Eastman School of Music. Around two dozen clarinetists attended. Most were college or graduate-school clarinet students, but there were also some professionals and educators. Many were current or former UGA or LSU students, and some were newly-admitted students looking to get a leg up for the fall. Although the attendees found time to socialize, explore the campus, and try some favorite local eateries, the overall tone of the camp was studious. Each day’s itinerary began with practice time at 8:00 A.M., and finished after three intensive masterclass sessions at 9:00 P.M. Most of the attendees stayed in inexpensive and convenient on-campus housing.